C-Forward supports early childhood reading and attendance in Covington! C-Forward, Inc., an information technologies company in Covington, KY is giving back to the community this holiday season in a way that promotes early childhood reading and improved school attendance. Staff decorated a Christmas tree with Dr. Seuss books and is donating it to the children at James E. Biggs Early Childhood Education Center in Covington, Kentucky. The tree is intended to encourage students to attend school and learn to read. Children with perfect attendance in December will be allowed to take a book from the tree. The tree will be on display at the C-Forward offices on Fri., Dec. 7 for an open house and then moved to the school. 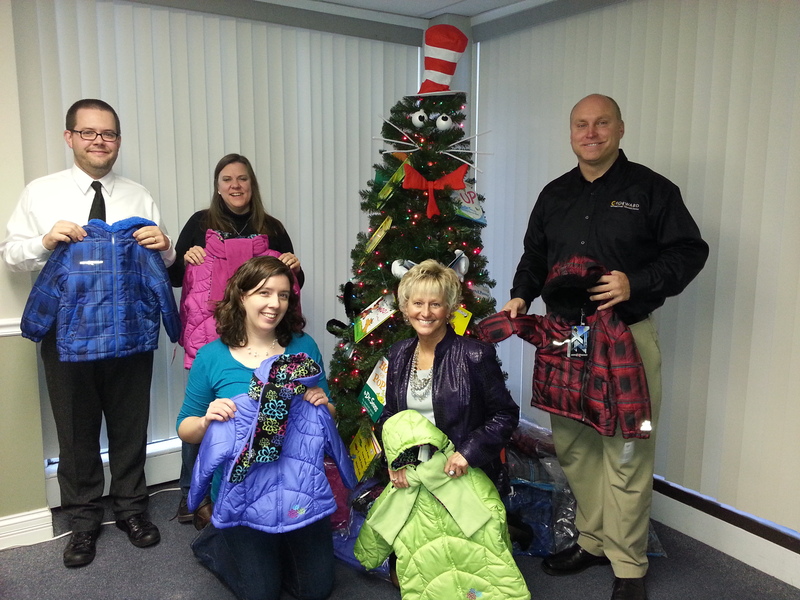 The company also purchased much needed winter coats for the school’s Family Resource Center to distribute to those students in need. C-Forward, Inc. and James E. Biggs were matched as B.E.S.T. Partners by the Northern Kentucky Chamber of Commerce in 2008. B.E.S.T. (Business Education Success Team) Partners work together to achieve specific goals.